Small rom with bunk beds and sink. The toilets and showers are in the corridor. The price includes breakfast, towels and bed linen. Our bigger 2-bedded rooms in Preikestolhytta have great views towards the lake and more space than the smaller 2-bedded rooms. 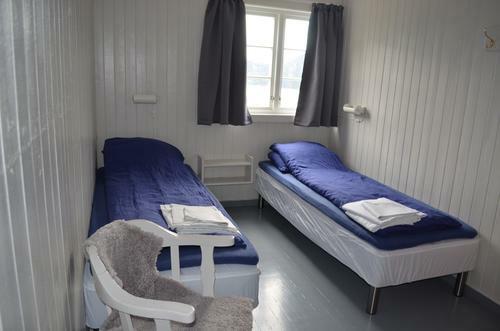 These rooms have all newly been renovated. Showers and toilets are in the corridor. The price includes breakfast, towels and bed linen. 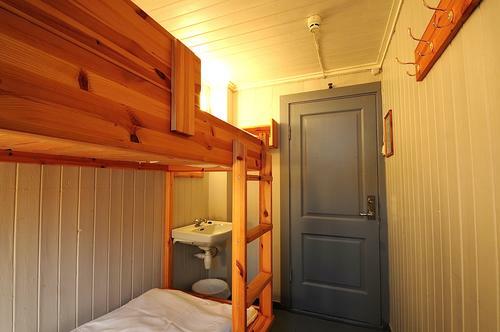 A room with 2 bunk beds. The price includes breakfast, towels and bed linen. The toilets and showers are in the corridor. 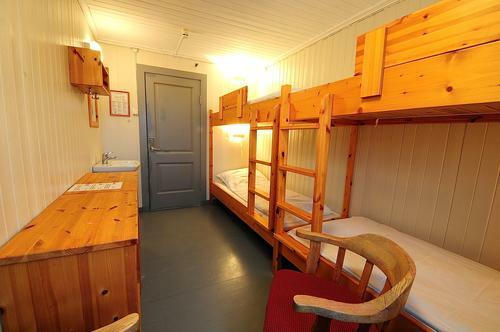 Members of DNT (The Norwegian Trekking Association) get 15 % discount on accommodation. The first tourists came to Preikestolen around the year 1900. Most needed accommodation for a night, and Stavanger Hikers' Association (STF) arranged for 3 rooms to be let on the roadless mountain farm Vatne in 1920. Another tourist station was additionally created on the farm Torsnes in 1925, also next to the Refsavatnet (Refsa Lake). The number of tourists was quick to augment, and especially in spring the farms were overflowing with hikers. Already in the late 1920s reports arrived of over 100 over night guests in a season at Torsnes. The trend was clear, and thus Preikestolhytta was built in 1949 to manage the increasing stream of tourists. Construction work started just next to the main building on the mountain farm Vatne. The Pulpit Rock was at this point internationally famous, the hut was constructed with the purpose of aiding hikers' pilgrimage to the famous rock formation. The construction of such a sizeable hut far into nature turned out to be a heavy undertaking for Stavanger Hikers'Association. All transportation of materials occurred from the nearest fjord, Lysefjorden. A motor driven trolley system was constructed from the fjord up the steep mountainside, finally reaching Refsavatnet just below the hut. A motorised boat carried people and construction material over the water. Lumber for the hut was chopped in the nearby forest, and a sawmill was constructed by the lakeside. In 1961 a car road was made which led all the way to the hut. This shortened the journey to the Pulpit Rock, enabling tourists to reach it in a day, thus changing the character of the Preikestolhytta.